At long last, the anticipation is over. The hype no longer matters. The time for spoilers, fan theories, and trailers has passed. 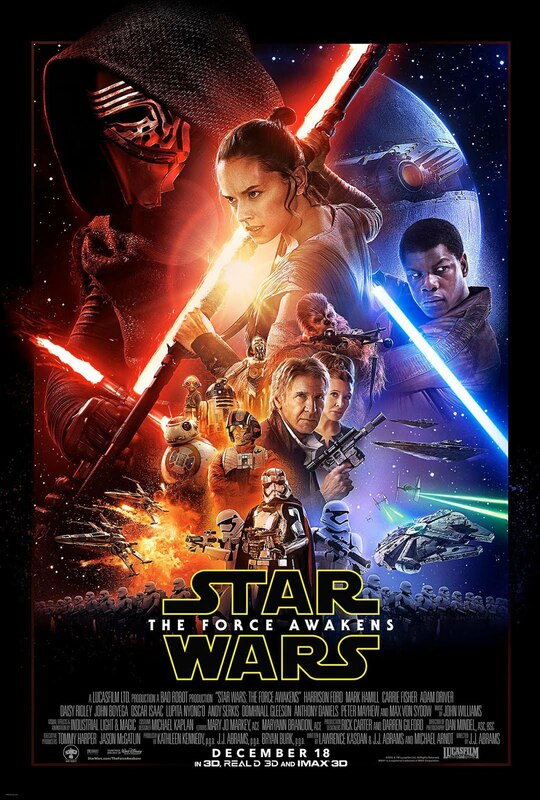 Star Wars: The Force Awakens (2015) is here, right now, on our movie screens. And, it’s fair to state it’s a good film. How do I make this particular assessment? “I hope the movie is coherent, joyful (in J.J. Abram's words), and exciting. That’s it. That’s all I wanted. That’s all I needed to write a positive review in this space. The movie didn’t need to be the Second Coming, or the best Star Wars ever. I just wanted those particular Christmas presents from it. J.J. Abrams delivers on quite a few of those deeply wished for items, and deposits coal in place of a few others. But overall I like the film a lot. It’s a solid, if not particularly inspired foundation for the new trilogy to build upon. I’m rather surprised that what The Force Awakens accomplishes well (and what it doesn’t do well) failed to line up with my expectations. For instance, I would say that the film is indeed joyful, though not particularly coherent or exciting. Furthermore, the action scenes are shot in undistinguished fashion, and don’t build suspense in any careful or sustained way. 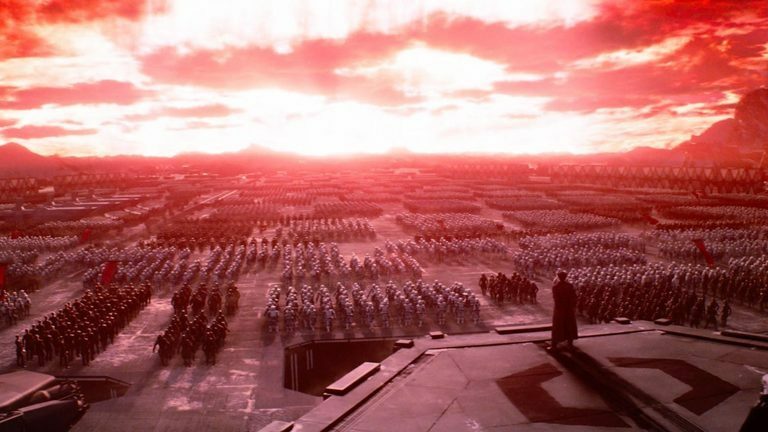 The film’s major threat -- Star Killer Base -- is a rehash of a rehash that never feels like a significant threat, or even a fully-formed plot-point. The film's big villain, Snoke, is a bust. Nor does The Force Awakens speak meaningfully about our world today, as -- love or hate them -- the George Lucas prequels definitely did. Abrams usually shies away from any kind of subtext in his work (the much derided Into Darkness  is a stark exception), and so perhaps it is no surprise that this Star Wars pretty much works on a surface, soap opera level, and leaves it at that. 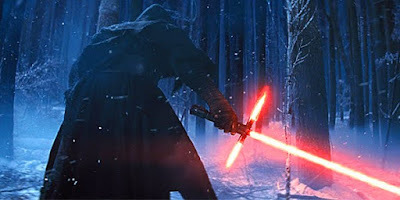 However, The Force Awakens does transport us back to the Star Wars universe with a lot of gusto and energy. That fact also seem undeniable. Where I feel the film succeeds most --- and the reason why I say it is “good” -- involves my final laundry list of qualifications. The film very meaningfully, and touchingly re-acquaints us with characters we love, and it beautifully -- and very successfully -- introduces us to new characters who are worthy to carry the torch. Harrison Ford is amazing in this movie in his attempt to revive and deepen the Han Solo character. He delivers a great, affecting performance. He is the film’s most valuable player, by a long shot. And that fact takes nothing away from the rest of the cast. The newcomers -- Daisy Ridley, John Boyega, Oscar Isaac and Adam Driver -- are nothing less than terrific. The casting for the movie is great, and I can already envision great moments from this group still to come in the rest of the trilogy. Given J.J. Abrams’ track record, however, I expected the film’s action to be achieved in more accomplished fashion and the treatment of the characters to be only mediocre, when in fact, the precise opposite appears true. This Star Wars movie earns major kudos because of the characters, first and foremost. They resonate, and never feel like cartoon stand-ins for real human beings. The reason to return to this galaxy far, far away in 2015 is, clearly, the people you meet there. A long time ago, in a galaxy far, far away, conflict still rages. The survivors of the Empire have re-formed under a new name, The First Order, and under a new Leader called Supreme Leader Snoke. The Republic is reformed too, and the former rebel alliance is now a resistance force battling the Order. Both sides seek to know the location of the last surviving Jedi knight, Luke Skywalker (Mark Hamill) who disappeared years ago, and whose whereabouts are unknown. General Leia Organa (Carrie Fisher) sends a hot-shot resistance pilot, Poe Dameron (Isaac) to the far-flung desert world of Jakku to recover a map revealing Luke’s location. 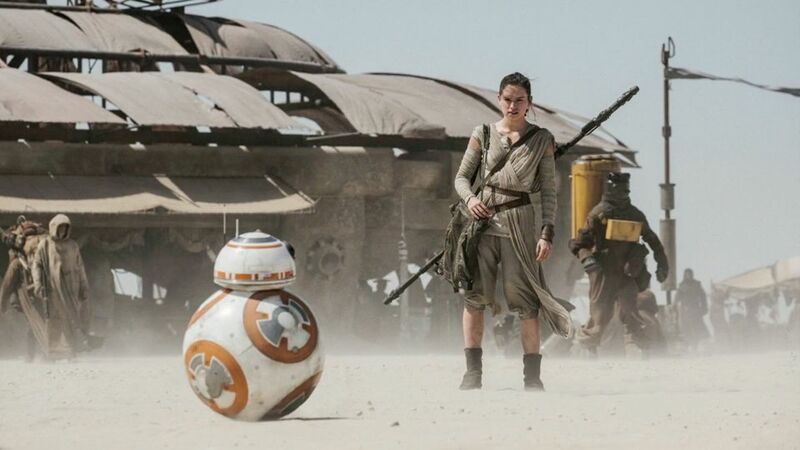 BB-8 meets a wily scavenger, Rey (Ridley) and she takes responsibility for Dameron’s mission, a mission that brings her into contact with Finn, Han Solo (Harrison Ford), Chewbacca (Peter Mayhew), and the Force itself. Now these new friends must get to know one another even as the First Order prepares to launch an attack with its deadly new weapon at Star Killer Base. I have lived long enough to see Star Wars re-use the same plot-line three times. The assault on the Death Star (Star Wars), the second Death Star (Return of the Jedi) and Star Killer Base (The Force Awakens) all repeat key plot points. First, there’s a weapon that can destroy planets in an instant. Then there’s a sustained fighter attack on the base. And finally, there’s a weak point on the evil base that can be exploited during that sustained attack. In two of the three attacks, there’s also a shield that needs to be brought down by a ground-team during the assault. The first part or movement of each Star Wars trilogy so far also features the youngster who is taken under the wing of an elder-statesman or wise-man. That wise-man -- as part of the hero’s journey -- must die before the story ends. Anakin loses Qui Gonn Jinn in The Phantom Menace. Luke loses Ben Kenobi in Star Wars. And Rey lose someone who fits that role in The Force Awakens. And then of course, we have our young hero. This person lives on a backwater world (Jakku or Tatooine), and experiences a mundane life as a farmer, slave, or scavenger. Soon, however, the galaxy comes knocking on the door of that character (often in the form of a droid), and the hero's true potential and destiny is realized. Thus we have Anakin/Luke/Rey. A couple of things we can consider here. The first is that each trilogy serves as a reflection of the earlier one(s). This is the grand saga of the Skywalker Family across three generations, and in each generation, the same events (attacks and deaths, as noted above, for instance), recur. If one accepts this line of reasoning then the repetition of similar events in The Force Awakens is intentional, and an attempt at a genuine artistic flourish, a sense that although the generations pass, the story remains the same. Another way to explain this is that although our generations pass, we keep looking to the same, unchanged mythology (especially in terms of the Monomyth) to understand our world. Star Wars keeps giving us new characters taking the same steps because the overall myth underlining the saga doesn’t change. It is universal, and eternal. Another line of defense for the over-familiar plot-line is this. Star Wars has always been first and foremost a pastiche: picking out and harvesting plots, characters, and set-pieces from other Hollywood and non-Hollywood movies and literary sources. 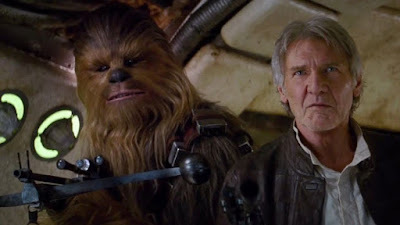 By now, Star Wars is actually a pastiche of itself, so a case can also be made that J.J. Abram has fashioned the whole 2015 film as a kind of tribute to the 1977 edition, deliberately sprinkling in familiar ingredients and plot points. And that’s why we get the new cantina (a poor reflection of the original, alas), and the McGuffin device of the Luke Skywalker map, which fills in for the Death Star plans of the original. 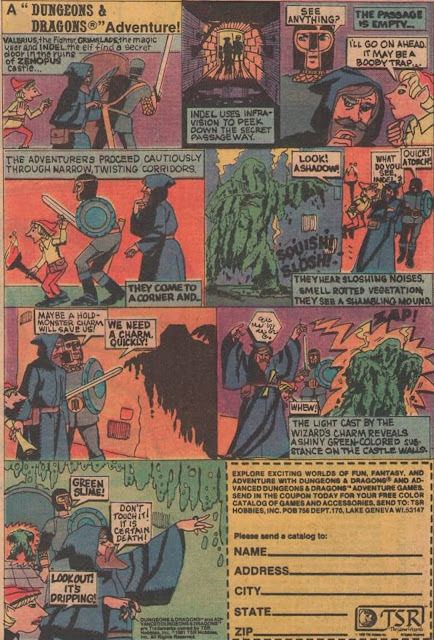 Yet by the same token, not one of these familiar plot points (with the possible exception of the death of the wise elder) is handled with enough flair or color to mask the fact that we are watching a very expensive narrative rerun, or hide that the plot has little or no originality, and thus little or nothing to offer in terms of real surprise. By comparison, the final trench battle in Star Wars was exciting, but also tense. The scene was incredibly suspenseful and it was constructed like an elaborate jigsaw puzzle. Jedi’s Death Star battle was a shadow of the first in terms of complexity and tension, but the film’s frenetic three-way cross-cutting between the Emperor’s Throne Room, the battle raging in space, and the boots on the ground on the moon of Endor, nonetheless created a kind of fever pitch intensity. The final battle in this film is totally devoid of any sort of escalating tension or suspense. At this point, it’s a foregone conclusion in a Star Wars film that the evil battle station will get destroyed with just seconds to spare before Princess Leia, C3PO and the rebel leaders -- standing grim-faced in their control room -- buy the farm. The film’s other action scenes aren’t any better, and many of them are actually tiresome. Much of the action in the film involves endless battles with Stormtroopers as they get shot up and blown through the air in explosions. The point, I believe is to show the practical nature of this Star Wars. Real people in costumes, in real locations, with real pyrotechnics. This is a rebuke to the prequels, I understand, but there is a sameness to all the action in this mode. Indeed, many of the film's act action sequences seem interchangeable, set in long, poorly lit, gray and red corridors. I said I wanted coherence, above, and the movie doesn’t always satisfy on that front, at least in terms of visual coherence. For example, it isn’t always clear when Ren is on the ground base or in the star destroyer -- the sets all look alike -- and it similarly isn’t clear whether the Star Killer Base destroys Coruscant or some look-alike planet. Leia mentions the Hosnian System, but as far as casual Star Wars fans know, Coruscant could be in the Hosnian system, right? I had to look it up on the net when I came home to see that Coruscant survived the film. Otherwise, I was going to complain that Abrams apparently possesses some kind of mean fetish for blowing up canonically-important planets (see: Vulcan). Even the light saber duel in The Force Awakens is not orchestrated in any sort of overtly memorable or suspenseful way we have come to expect; one that would suggest the outcome could be uncertain. In this regard, The Phantom Menace’s light saber duel is far superior. It is clever, indeed, to give us a fight between two (or three, actually…) untrained saber fighters in The Force Awakens, but as a result of the characters’ inexperience, the fight lacks any kind of visual distinction. It’s just people hacking and charging at each other in a picturesque setting. Although Abrams occasionally lands on a memorable shot (like TIE fighters silhouetted against the glowing orb of a burning alien sun), there are very few compositions in The Force Awakens that stir the emotions, or ignite the imagination. There is no equivalent here of that famous “sunset” shot, for instance; that moment of yearning in the original Star Wars. Even against 21st century contemporaries, The Force Awakens is a letdown in terms of its action and visualization. This film doesn’t have one-tenth the visual brawn of Mad Max: Fury Road (2015), for example, which sustained a car chase for two hours, essentially, via dazzling cinematic chops. What Star Wars: The Force Awakens lacks in spectacle, suspense and real adrenaline, it absolutely makes up for, however with a lot of good humor, sly banter, and strong characterizations. Harrison Ford and Carrie Fisher bring grace and charm to their roles. They don’t get a whole lot of screen time together, but they make the most of it, for certain. Fisher has less time to make an impact that Ford gets, but she registers strongly. Ford is fantastic in this movie. It’s funny, but Harrison Ford’s persona in later years -- Air Force One (1997), even Ender’s Game (2014) -- is, well, kind of dour. I wondered if he could find the Han Solo within, after all this time away from the part. He sure as hell does. The interlude that involves his discovery of the Millennium Falcon, a smuggling deal gone wrong, and some hungry living cargo that gets loose aboard his ship is, in many ways, the high point of the film. Here, Ford performs the miracle of reminding us of the devil-may-care young Solo, while projecting, simultaneously, the idea that he has lived through all these years and adventures since the last time our paths crossed. And when later scenes require Ford to tread into trick emotional territory, he is also up to the challenge. He nails every nuance of the character. It’s also great to see returning characters Chewbacca, R2-D2, and Admiral Ackbar, but the film’s best introduction of an old friend belongs to none other than C3PO (Anthony Daniels) who -- with typical lousy timing -- inserts himself into the middle of a Han-Leia reunion. This scene really made me laugh, and brought back memories of the characters as they interacted in The Empire Strikes Back. Like so many moments in the film, this scene is delightful. The new characters -- Finn, Poe, Rey, Ren, and BB-8 – are also handled very, very well. There isn’t a bad actor or bad concept anywhere in the bunch. These new individuals all manage to come across as vivid and real personalities, with Ridley’s Rey being the obvious stand-out. She’s a real find. The camera loves her, and so, I suspect, will every fanboy (and girl) in the universe. Rey is strong and resourceful, independent and funny, vulnerable and tough, at the same time. I can’t wait to see her character grow over the next two films and I am glad she so capably takes center stage here. I look forward to Rey being the central character in this chapter of the Skywalker Saga. The one character who didn’t work for me at all in the film is Supreme Leader Snoke. He is composed of (bad) CGI, and looks like uncomfortably like Lord Chaos from Skylanders, right down to his choice of wardrobe. I didn’t find him particularly menacing or interesting. He’s like a weird-place holder or something, until the trilogy’s real villain shows up, or takes center stage. My son Joel insists we haven’t really seen Snoke at all, only his holographic image, and that the real Snoke will look quite different when we finally meet him in the flesh. I hope so, because I couldn’t take him seriously in this guise. Of all the characters, he is the one who transmits as a cartoon, a parody of the kind of villain we would expect in a Star Wars film. Finally, I should add that The Force Awaken’s climactic scene packs a punch, in part because of the location shooting, in part because of the return of another major, beloved character. This is the best filmed scene in the movie, and will be a great leaping off point for Episode VIII. It feaures the visual coherence or poetry that the remainder of the film seems to lack. It is also, finally, suspenseful. The Force Awakens is an entertaining and solid Star Wars entry, and that’s what I hoped it would be. I was satisfied with the film on many fronts while feeling that -- much how I felt about The Phantom Menace -- there is also significant room for improvement as the saga continues. The Force Awakens is a good beginning to the third Star Wars trilogy, but it's not the greatest show in the galaxy. As the nostalgia and hype wear off, people will begin to see this film and its values and deficits more clearly, I believe. Great honest review. Force Awakens is better than Return Of The Jedi. Albeit, second best to both Empire Strikes Back and Star Wars(A New Hope). This final trilogy with episodes 8 and 9 will be wonderful, like the original, based on 7:Force Awakens. I'm not so sure the force was with this one. In fact, the more I thought about it I think the prequels may have been better.